1) First we start with a metal frame. We attach the mesh and then tighten it out. 3) After it dries, the emulsion is coated on. It then has to dry in our temperature controlled cabinets. It usually takes the emulsion about a day to dry. 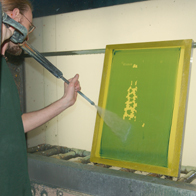 5) The screen is then rinsed with water to remove the print areas where the ink will be allowed to print through. 2) After a few days of letting it sit, we tighten it even more. 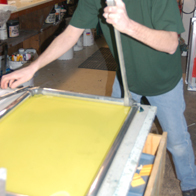 This allows for a cleaner print during the printing process. 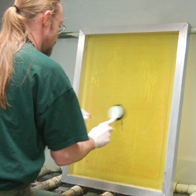 Then the screen is washed and degreased to prepare for the emulsion. 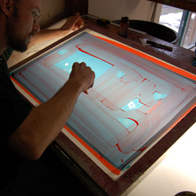 4) The screen is now ready to be exposed. 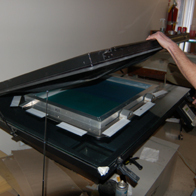 A film positive is attached and the screen is placed in the exposure unit. 6) It is then recoated with a blocking solution to cover any pinholes that may have appeared. Now the screen is ready to be sent to the printing department.